Global robotics industry is expanding on the back of factors such as rising need of automation, operational efficiency and increasing human errors. Worldwide robotics spending reached USD 92.5 Billion in 2016 and it is anticipated to double its size by the end of 2020, reaching a valuation of USD 184 Billion. Snake robots are type of self-contained portable devices which can easily be access in confined spaces where the human reach is quite difficult. They help in the automating systems and improve in the accuracy of surgery. On the other hand, vast applications of snake robotics in healthcare sector, manufacturing sector, defense sector and aviation industry is rising the sales of global snake robotics market. Snake robots have the ability to work in confined spaces for dismantling the components. Snake robots have surgical applications in healthcare sector which makes them more useful in the particular sector for various operations. Adoption of snake robots in aviation industry is one of the key aspects which are fostering the growth of global snake robots market. Goldstein Research analyst forecast the snake robots market size is set to reach USD 2.5 billion by 2024, growing at a CAGR of 12.10% over the forecast years 2016 to 2024. Global snake robots market players are continuously working on the research and development activities to introduce advanced snake robotics for various applications. The technological advancements in snake robotics further create a huge trend in the robotics industry which further triggers the growth of global snake robotics market over the next five to six years. The report covers the present ground scenario and the future growth prospects of the snake robots market for 2016-2024 along with analytical view of the snake robots. We calculated the market size and revenue share on the basis of revenue generated from major players across the globe. 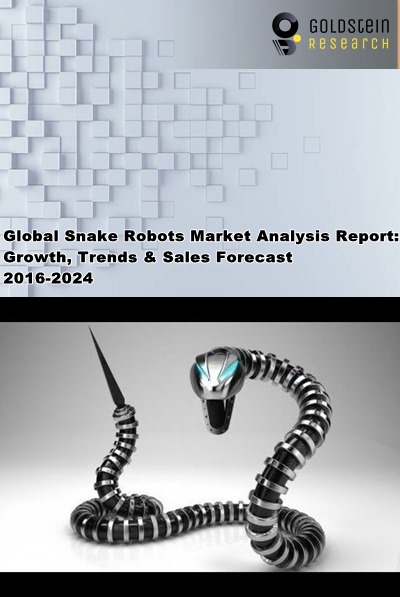 We forecast the global snake robots market on the basis of current growth of robotics industry and the latest advancements in snake robots. The rising implementation of snake robots in healthcare, aviation and construction industry is expected to drive the global snake robots market. On the basis of end-user, healthcare sector held the largest market share of 28.7% in 2016 due to its enactment in open heart surgery, where the patient’s arms are attached through the tubes while the patient-side cart is placed next to the operating table with the electromechanical arms that is arranged to provide access to the initial ports selected by the respective surgeon. On the other hand, defense is expected to rise by the fastest rate of 21.9% as they can help in saving life of people through surveillance feature of snake robots in accident and natural disasters arena’s as they are equipped with sensors, GPS and video cameras. Global snake robots market outlook 2016-2024, has been prepared based on an in-depth market analysis from industry experts. The report covers the competitive landscape and current position of major players in the global nanomaterial market. The report also includes porter’s five force model, SWOT analysis, company profiling, business strategies of market players and their business models. Global snake robots market report also recognizes value chain analysis to understand the cost differentiation to provide competitive advantage to the existing and new entry players. Our global snake robots market report comprises of the following companies as the key players: Fanu, HiBo, Kawasaki Robotic, Kuk, Medrobotic, Mitsubishi, OC Robotic, Sarcos Cor, Sinte, Tesl, Unifir, Yaskaw. According to the report, the major driver of the global snake robots market is the extensive use of snake robots for minimal invasion surgery in healthcare sector. The robotics revolution in surgery is one of the major factors which are driving the demand for snake robots in healthcare industry. Clubbing of drug therapies and radiation treatment with robotic surgery can be used as a replacement of open surgery in future. Moreover, the technological advancements in snake robotics along with the vast application in manufacturing industry are also some of the key factors which help the market to grow substantially over the next five to six years. Rising maintenance activities in aviation industry is also making a room for snake robots to reduce the turn-around-time (TAT) of aircraft engine maintenance. Further, the report states that the major challenge for the industry players is the high cost of snake robots and sluggish demand in mature markets. Moreover, the companies that enter into the market space at an early stage will have significant advantages. On the other hand, there is a major challenge for new players to enter into the market owing to high investment required to manufacture snake robots. Also, high investment required for research and development activities is a major barrier for the existing players. Based on geography, North-America region leads the snake robots market with 46.0% owing to high adoption rate of snake robots in healthcare sector. Expansion of aerospace industry in the United States along with the improved aerodynamics and standardization is fuelling the demand for snake robots market. However, Asia Pacific snake robots market is increasing steadily with a growth rate of 22.0% over the forecast period. Countries such as China, Indian, Japan, Hong Kong and Singapore are more involved with snake robotics because of their vast application in healthcare industry, communication industry, aviation and defense sector. What is the revenue of snake robots in 2015-16 and what would be the expected demand over the forecast period?